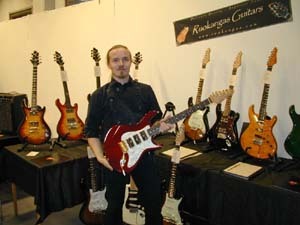 Report from Guitar show in Stockholm Sweden 26-27th of October. UGG attended the big Guitar show in Stockholm and took the opportunity to display some Mystique amps as well as The Komet and an assortment of pedals. 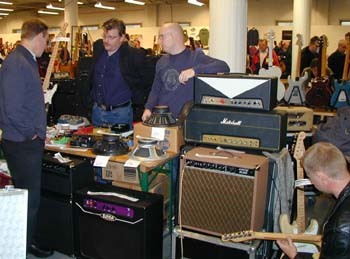 The annual guitar and Drum show in Stockholm is a great opportunity to hang out, look at great guitars and amps and just talk to other gear freaks. This year was special for us since we presented the Ulitimate Guitar Gear concept and displayed some cool gear including, Mystic Blues Trixie and Ruth and the Komet amplifier. In this environment its not very popular to really try the amp at good volume (i.e. LOUD) but people who tried the gear was very positive. Even at low volume you are able ta hear the treble sparkel of a Mystic or the mighty potential for Rock’n’Roll of the Komet. We did have the opportunity to let Nusse from the Swedish guitar Magazine FUZZ (http://www.fuzz.se ) hear and try the Komet at a more suitable volume, from the Komets point of view, and we can safely say that he was VERY impressed. The one thing he commented most was the feelings that you can control the amp from the tip of you’re pick. Sadly the room we tried the Komet in was like bath room, small and with HARD walls so it’s not a place for a REAL try out. We will have a real Tone Party with the Komet soon, keep posted and you hear more. It was also the big launch for the Mad Professor amp. The Mad Professor is designed by Björn Juhl, the man behind the BJF line of effects pedals. 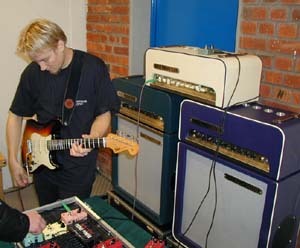 Olli Siikanen demoed it in Custom Sounds (http://www.custom-sounds.com) both for two days solid. We from UGG were twenty meters away in the direction of Olli’s speakers so it’s safe to say that we have HEARD the amp. It seems to bee a quite flexible amp able to produce Fender, Marshall and Vox type of tones. It’s hard to say anything about and before you have tried it out by you’re self. We hope to get back with a Tone Party review of the Mad Professor quite soon. The show it self is mainly centered on vintage gear. Dealers from both Sweden, Finland and Denmark where there. The distributors of Gibson, PRS, Rickenbacker and Gretch where there as well and interesting amps besides our stuff and the Mad Professor was THD and Bad Cat. Directly in front of the speakers of the UGG amps where Juha Ruokangas who tried to talk to people about his beautiful Ruokangas (http://www.saunalahti.fi/~ruokanga/) Duke, a excellent guitar in the style of PRS and LesPaul, and VSOP a very nice Strat style guitar. UGG shared table with some Swedish amp builders who displayed their work and sold all types of things centered around amp building, transformer, tubes, speakers and so on. We plan to write a something later around some of these builders and we are impressed with the knowledge of tube amps these guys have. The only link we have at this time is to VintageVibe (http://www.vintage-vibe.net). We were very pleased with the attention we got with our gear and we thank all the great people who took the time to talk to us and made this a nice experience.